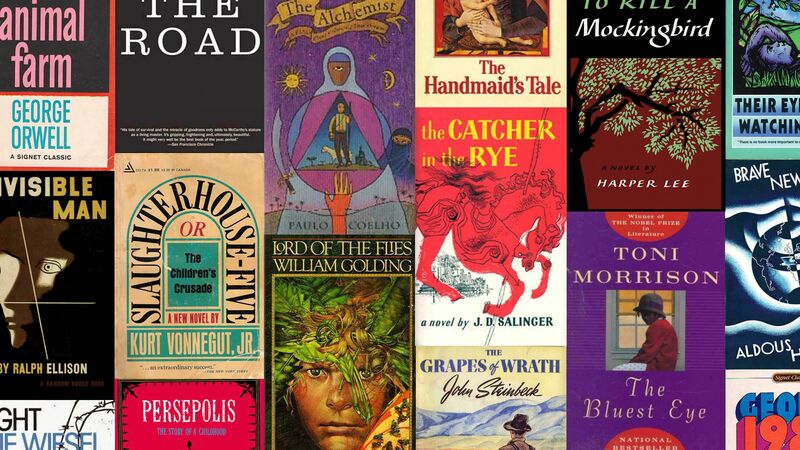 We asked our community which works of literature were must-reads for high schoolers. Here are your top picks. The more things change, the more they stay the same. The final cut of our list of indispensable high school reads—culled from reader comments—is dominated by perennials like George Orwell’s Nineteen Eighty-Four and J.D. Salinger’s The Catcher in the Rye. The five most popular entries were all published within 15 years of each other, and none were published later than Harper Lee’s To Kill a Mockingbird in 1960. Only three of the works on the list could be considered recent, appearing within the last 20 years: Stephen Chbosky’s epistolary novel The Perks of Being a Wallflower (1999); Marjane Satrapi’s graphic memoir Persepolis, about growing up during the Iranian Revolution (2000–03); and Cormac McCarthy’s brutal, dark novel The Road (2006). The specter of World War II, with its themes of totalitarianism, social fragmentation, mass surveillance, and the decline of individual freedom, looms over many of the novels. Dystopian novels form a major category: Orwell’s Animal Farm, William Golding’s allegory The Lord of the Flies, Aldous Huxley’s Brave New World, Kurt Vonnegut’s absurdist comedy Slaughterhouse-Five, Margaret Atwood’s The Handmaid’s Tale, and McCarthy’s The Road join Nineteen Eighty-Four here. Thinking back on my days as a high school English teacher, it feels like I missed an opportunity to teach dystopia as a theme. There’s a wealth of material to draw from—and it’s both high quality and accessible to a broad range of high school readers. A recurring pedagogical issue emerged as teachers joined the conversation: How should educators balance challenging books—works by Shakespeare, for example—with the students’ desire for choice? How can teachers ensure rich, shared learning opportunities without putting their students off reading forever? These aren’t idle concerns. If your goal is to nurture a lifelong love of reading, a dogmatic reliance on the classics appears to be catastrophic. Harper Lee’s seminal coming-of-age story set in the fictional southern town of Maycomb, Alabama. Primary themes of interest to high schoolers: racial injustice, moral and spiritual growth, courage and integrity, innocence and experience. George Orwell’s vision of a totalitarian future, not long after the Atomic Wars have reduced the geopolitical map to three superstates: Eurasia, Oceania, and Eastasia. Primary themes of interest to high schoolers: totalitarianism and state power, surveillance, individual freedom, the nature of truth, the power of propaganda. William Golding’s tale of child castaways who establish a violent social order on a deserted island. Primary themes of interest to high schoolers: civilization and governance, social and moral order, savagery and primitivism, cruelty, leadership, injustice. George Orwell’s allegory tracing the formation of Soviet Russia. Primary themes of interest to high schoolers: totalitarianism and state power, individual freedom, the mutability of historical truth, the power of propaganda, the cult of personality. The reclusive J.D. Salinger’s most popular novel, told through the eyes of the notoriously irreverent teenager Holden Caulfield. Primary themes of interest to high schoolers: unreliable narrators, individuality and identity, social alienation and rebellion, social mores and rules. John Steinbeck’s Depression-era classic, which follows the travels of impoverished Dust Bowl refugees as they flee westward to California. Primary themes of interest to high schoolers: wealth and poverty, injustice, social and political policy and governance, biblical themes such as judgment and redemption. Ralph Ellison’s meditation on the effects of race, told from the perspective of an African American narrator rendered invisible by his skin color. Primary themes of interest to high schoolers: race and racial injustice, identity, ideology and belief systems. Paulo Coelho’s tale of a Spanish shepherd who hopes to find his destiny on a journey to Egypt. Primary themes of interest to high schoolers: adventure and courage, hope, destiny. Kurt Vonnegut’s dark, absurdist comedy centered on the devastating firebombing of Dresden, Germany, during World War II. Primary themes of interest to high schoolers: nonlinear narratives, unreliable narrators, existentialism and absurdism, the true nature of warfare. Margaret Atwood’s dystopian novel depicting the rise, in the United States, of a theocratic government dedicated to the oppression of women. Primary themes of interest to high schoolers: totalitarianism, patriarchy and misogyny, surveillance, politics and governance, gender roles. F. Scott Fitzgerald’s lyrical, Jazz Age novel about the idealist James Gatsby—and the nature of the American Dream. Primary themes of interest to high schoolers: the Jazz Age, the American Dream, wealth and class, idealism. Toni Morrison’s story of Pecola Breedlove, a young, often-abused African American girl who dreams of having blue eyes—a tangible sign of acceptance in a world dominated by white conceptions of beauty and belonging. Primary themes of interest to high schoolers: identity, race and racial injustice, the effects of abuse, beauty and ugliness, insanity. John Steinbeck’s story of an unlikely—and tragically fated—friendship between two men of remarkably different intellectual abilities. Primary themes of interest to high schoolers: friendship and loyalty, character, cruelty and mercy. Shakespeare’s portrait of an ambitious Scottish warrior who wants to be king—and is goaded to murder to achieve his goal. Primary themes of interest to high schoolers: the nature of evil, power and ambition, insanity, chaos and disorder. Aldous Huxley’s slim novel envisioning a future “utopia” with perverse qualities—as the human race succumbs to overdoses of pleasure, amusement, and hedonism. Primary themes of interest to high schoolers: genetic manipulation, state power, drug use, individualism and society. Cormac McCarthy’s bleak novel about a boy and his father seeking safety in a post-apocalyptic world. Primary themes of interest to high schoolers: good and evil, death, apocalypse, cruelty, hope and hopelessness. Zora Neale Hurston’s heavily vernacular novel depicting the life of Janie Crawford, an African American woman in the Jim Crow South at the turn of the 20th century. Primary themes of interest to high schoolers: gender roles, race and racial injustice, the effects of abuse, the representation of American dialects, the nature of love. Stephen Chbosky’s epistolary, coming-of-age novel about an introverted, emotionally scarred high school freshman named Charlie. Primary themes of interest to high schoolers: introverts and extroverts, teen romance, alcohol and drug use, the effects of abuse. Marjane Satrapi’s graphic novel, an autobiography that describes growing up in Tehran, Iran, during the era of the 1979 Iranian Revolution. Primary themes of interest to high schoolers: graphic novels, Iranian culture, politics and religion, war. Elie Wiesel’s spare memoir-novel based on his experiences in concentration camps during the Holocaust. Primary themes of interest to high schoolers: good and evil, the Holocaust, faith and faithlessness, the Jewish experience. Please feel free to suggest more indispensable high school reads—we’d love to add to the list. After all, more choice can only assist teachers engaged in the essential, never-ending work of helping students master literacy. And let us know if we should start lists for elementary and middle school too . . . The author of this article is the chief content officer at Edutopia. You can follow him on Twitter @smerrill777.